Judge Kristine M Schmidt wasn’t everyone’s cup of tea. She’s from Long Island and is a little brusque. I don’t know, I’m not looking for a new BFF, just a fair judge with fun courses, and she provided those! Her courses were really technical and challenging but still fun, and they were quite devious in that often the solution you found for the challenge created a whole new challenge! Nina had a perfect NQ weekend but ran fast and happy and sassy and I will take ANY NQ’s like that! Love her! She didn’t knock any bars all weekend either! Zhora had a FAST Q on Saturday (her only Q that day), and QQ #95 today. Our “slump” (such as it is) is I think because she’s kicked up a notch in speed and distance and it’s taking me a while to adjust my handling to it so our mojo is off. She’s amazing. I love her so much and she loves this game so much. I am very lucky to have her. And ALICE! Her first time doing “real” agility and she ACED it. Beautiful FAST Q (her second NFP leg! ), beautiful Standard Q (her first NAP leg!) and got the zoomies in Jumpers, which I was happy about! She seems to stress up like her mum and grandma, which is perfect. I dared to fix the weave poles in Standard but I USED her zoomies in Jumpers and was thrilled she came back and worked with me even with an attack of the crazies going on. Just thrilled with her. My goals are simple: show her how much fun this can be, get some experience under her belt, find the holes in my training, zero expectations otherwise. We are doing one day a weekend plus games on other days if appropriate. I am going to be strict with myself per Melanie Miller’s advice and fix just about nothing. There is a HORRIBLE wind storm going on here, big branch off the tree in front…we are SO glad we put the money into trimming that tree and taking down the dead ones! Crazy 8s is a fun two minute search for 8 rats hidden along with four litter tubes. Your dog earns 10 points for each rat, a climb, and tunnel. A false alert is minus 20 points as are failures to climb or tunnel. A second false alert is a NQ. 500 points are required to earn the Bronze title. Lobo is Alkemi Beowulf del Roble LS and Zhora’s brother. This is Lobo’s THIRD breed first. Jan and Lobo are a force of nature! Judge Ginger Robertson set some technical, tight and fun courses for us. And NINA IS BACK! Feeling great, like her old self, sassing me, crazy to get going, just does my heart so much good to be playing with her again! Zhora earned QQ #94, an uncharacteristic bar cost us a QQQ, and two NQ’s today, but fast and fun and awesome runs. With severe storm warnings for Saturday/Sunday, I decided to make the drive today for just one day. Sure was worth it! Zhora Triple Q’d (she is so awesome) and her daughter Alice made her trial debut (I had a sentimental/superstitious need to have Alice make her debut under our dear friend and favorite judge Sherry Jefferson). My goal was simply to have her get her feet wet, maybe do some obstacles, hopefully mostly stay with me, so I came up with a simple FAST course, just jumps and tunnel and the aframe (which she loves), I didn’t ask for a startline stay, just wanted to keep it up and high energy and fun. HOLY MOLY! 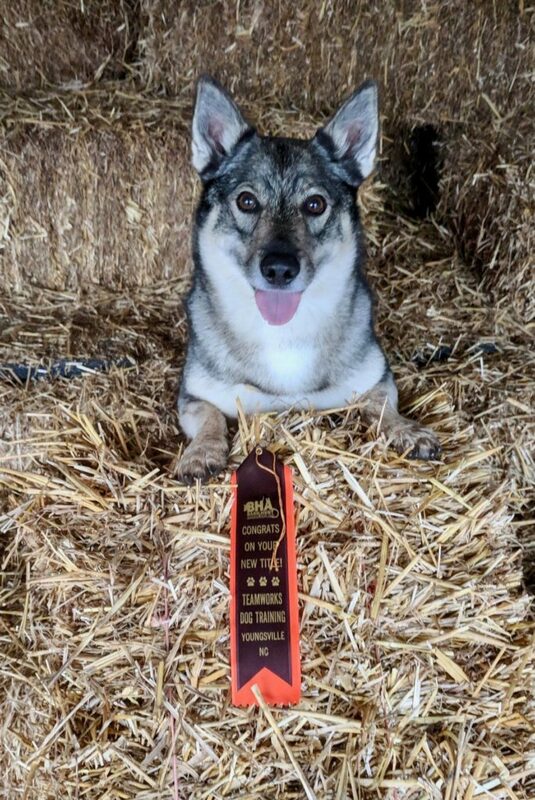 She was a ROCK STAR, ran amazingly well, COMPLETELY ignored Judge Sherry (who is also her beloved Aunt Sherry, and even Zhora had to give Sherry the “hey Aunt Sherry!” eye), stayed focused and happy and completely unfazed and the icing on the cake was that she QUALIFIED! She’s never run on turf, she’s never run in a match or a trial…no worries. I had zero expectations of her (and I still don’t, my only goal at this stage is for her to learn how fun and exciting this is), but holy moly was I impressed. She’s the first dog I did OneMind Dogs methods with from the start, and I do think it made a huge difference, she understands so much more at this stage than I ever hoped she would, plus she has that awesome temperament, she doesn’t worry, she doesn’t fret, she takes her job seriously, she is a working dog and exactly what I hoped for from this litter. Zhora and Bert, you did good! The first trial of 2019 is in the books under judge Laura English. Nina’s bout of pancreatitis that started at the Alkemi reunion and kept her out of the Invitational flared up acutely the weekend before New Year’s and culminated in three days of hospitalization over New Year’s at Orchard Park Veterinary Medical Center. I genuinely thought we could lose her for a bit but she’s home now and doing very well. I am cautiously optimistic. So Zhora ran alone this weekend. I could tell that my stress levels have affected things so I wasn’t thrilled with my handling but I was thrilled with her performance.